At 40 square miles the Cotswold Water Park is approximately the same size as the Island of Jersey. It is that part of the Upper Thames catchment in North Wiltshire & South Gloucestershire which has been subjected to over 50 years of sand & gravel extraction. 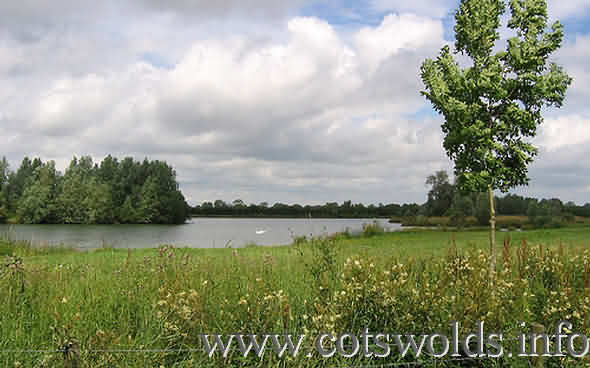 For detailed information on the Cotswold Water Park . Cirencester is the nearest of the Cotswolds Market Towns and as you would expect there are plenty of places to shop and numerous inns but lodgings and accommodation in the town centre is a little limited. The Bull Pen is located at the edge of the village of Poole Keynes, some 4 miles from Cirencester. It is now a family home and offers comfortable accommodation for visitors in a quiet location overlooking open fields, on the edge of the Water Park. Originally in 1836 as a granary and stables for a working farm, latterly, part has been used for a bull pen for the farm opposite. Converted in 2008, it offers two en-suite double bedrooms with comfortable furnishings, LCD freeview television and Wi Fi. A further double bedroom with twin beds is available on request. The bathrooms are well equipped with separate showers and baths. There is ample off road parking space. Breakfast - a Continental Breakfast is provided. Nearby - we are close to Cotswold Airport, Cirencester, Cotswold Water Park and are convenient for Bath, Cheltenham, Westonbirt and Badminton. Kemble main line station is about 2 miles. The Thames Path is but a short walk away and the source of the River Thames a little further at about 4 miles. There are number of excellent pubs and restaurants in the vicinity. Tariff – Prices are per room per night:- Double Room en-suite - £84.00 (inclusive of breakfast). The luxury self-catering apartments offer stylish, flexible accommodation with kitchen facilities - perfect for a family or group. You will have full access to the hotel's facilities. 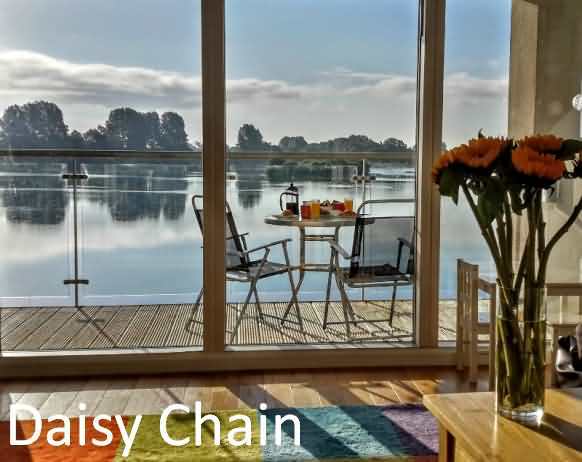 Daisy Chain, Cotswold Family Holidays, is a luxury 5 bedroomed contemporary glass fronted home with wonderful uninterrupted views over a large lake. 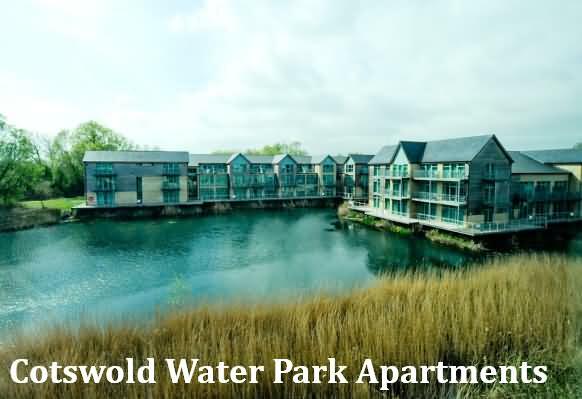 It is situated on the private Lower Mill Estate Nature Reserve in Cotswolds Water Park and is perfect for Cotswold Family Holidays. Daisy Chain sleeps nine in five bedrooms, with two ensuite bathrooms and one family bathroom. There are two double rooms, a twin bedded room, a bunkbed room and a single room. There is also a cot and a travel cot if required. Families are very welcome and the property is well equipped to make your holiday that little bit easier. The accommodation is spread over three floors with the living accommodation on the first floor to make the most of the amazing views over the lake. Unlike many properties the house enjoys uninterrupted view. The Lower Mill Estate is a 550 acre private estate and nature reserve. There are numerous walks or cycle rides to enjoy, bird hides to enjoy the multitude of birds or why not try to spot the beavers or otters that live wild on the estate. If fishing is for you, fishing permits are provided with the property. For a bit more action, there are a multitude of other activities available within a few miles - from windsurfing to waterskiing, aerial adventures to golf you are bound to find something new to have a go at. The Cotswolds Country Park and Beach is just a short bike ride from Lower Mill - here you can have a sailing or windsurfing lesson, play on the sandy beach or hire boats or bikes. 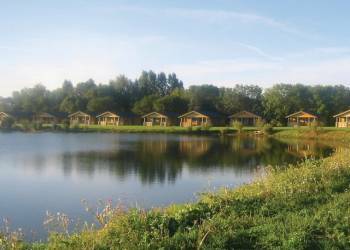 Idyllically located within the ever popular Cotswold Water Park, each luxury Scandinavian timber lodge boasts a modern and contemporary interior and all boast magnificent lake views in a truly breathtaking location. The perfect retreat for a relaxing break away from it all, the lodges are ideal for those seeking a base from which to explore this delightful local area which is world renowned for its picture postcard villages and wealth of National Trust and English Heritage properties. 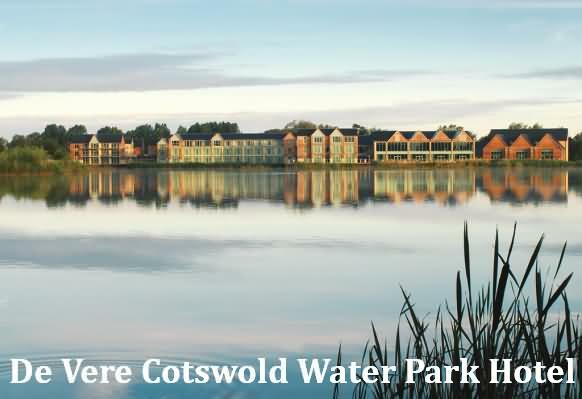 The Cotswold Water Park boasts over 130 lakes, so watersports opportunities abound. Excellent fishing* opportunities for all ages and abilities are available too – making this an ideal location for those seeking more active pursuits. Enjoy a bite to eat in the waterside café and savour the superb views.